FASTER ON DESCENTS: Dropping down a 5% grade, a rider on a traditional lightweight bike would need to put out over 300 watts just to keep up with a rider spinning at a recovery effort on a SystemSix. FASTER ON THE FLATS: At 48km/h (30mph), SystemSix saves you over 50 watts - huge savings considering an average Cat 1 racer’s Functional Threshold Power is around 350 watts. And even when drafting, you’re still getting up to 60% of that benefit. FASTER IN THE SPRINTS: In a 200m sprint with riders putting out a 1000 watt effort, the SystemSix rider would be four bike lengths ahead at the line. EASIER WHEN CRUISING: Even at a mellow group ride pace, SystemSix requires about 10% less power to maintain speed, leaving you with more in the tank when it’s time to throw down. Frame - ALL-NEW SystemSix, BallisTec Carbon, Di2 ready, SAVE, BB30a, flat mount, Speed Release thru-axle. Fork - ALL-NEW SystemSix, BallisTec Carbon, Speed Release thru-axle. Rims - Fulcrum Racing 400 DB, Alloy clincher, 35mm deep. Hubs - Fulcrum Racing 400 DB, 12x100 front, 12x142 rear. Spokes - Fulcrum double-butted, Stainless, Bladed. Tires - Vittoria Rubino Pro Speed, 700 x 26mm (23c). Crank - Cannondale HollowGram Si, BB30a w/ OPI SpideRing, 52/36. Bottom - Bracket Cannondale Alloy PressFit30. Chain - Shimano 105, 11-speed. Rear - Cogs Shimano 105, 11-30, 11-speed. Front Derailleur - Shimano Ultegra, braze-on. Rear Derailleur - Shimano Ultegra GS. Shifters - Shimano Ultegra hydro disc, 2x11. Handlebar - Vision Metron 4D Flat, UD Carbon. Grips - Prologo One Touch. Stem - Vision Trimax OS, 2014 Alloy, 3D Forged. Headset - Tapered, 1-1/8” upper, 1-1/4” lower bearing. Brakes - Shimano Ultegra hydro disc, 160/140mm RT81 rotors. Brake Levers - Shimano Ultegra hydro disc. Seatpost - Cannondale KNØT Carbon, 330mm. Full System Integrated Design - The frame, fork, seatpost, bar, stem and wheels were designed together as a holistic system to minimize drag, enhance comfort and optimize stiffness. 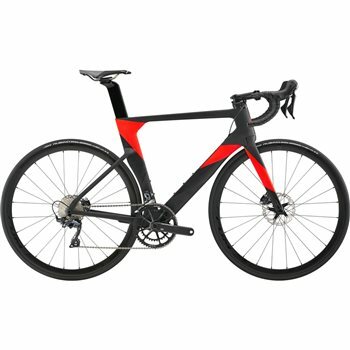 Tailored Airfoils - Every section of the frame, fork and seatpost features it own customized truncated airfoil shape, designed to reduce drag across the effective yaw range. Downtube and seat tube shapes minimize the aero effect of bottles, because that’s how we ride. Disc Only - Disc specific design allowed for aerodynamic optimization of the frame and fork and a wheel/tire choice that would not have been possible with rim brakes. Hidden Cable Routing - Unique design routes brake lines and Di2 cables through an opening in the front of the headtube, bypassing headset bearings. An integrated steering stop prevents damage to the cables and permits a full +/- 50 degrees of steering rotation (regular riding rarely sees more than 35 degrees of movement). Cannondale KNØT SystemBar - Provides the low drag and sleek look of a one-piece system, with the fit and Interchangeability benefits of a two-piece bar and stem. 8 degrees of pitch adjustment. Narrow bar width with flared drops brings your arms closer together when on the hoods for lower drag. Removable cable cover for easy set-up. Gated Spacers - For faster, easier wheel changes, the Frame and Fork use the Speed Release thru-axle standard. Compatible with any standard thru-axle wheelset. HollowGram KNØT 64 Carbon Wheels - KNØT 64 combines optimal aerodynamics with all the benefits of big tires. Speed Release Thru-Axles - For faster, easier wheel changes, the Frame and Fork use the Speed Release thru-axle standard. Compatible with any standard thru-axle wheelset. Power2Max Power Meters - Light, accurate and reliable Power2Max spiderbased power meters are included on most models. Turn it on with a one-time activation fee and start getting faster. It’s power made easy.